Stateline resident Lyndsey Bednar took second place in the womenâs 100 mile portion of the Tahoe Rim Trail Endurance run, July 15-16. She ran for over a day, finishing with a time of 27:05:18. 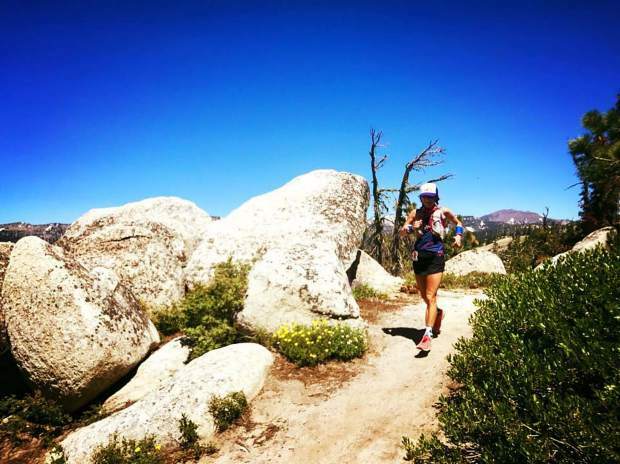 The Tahoe Rim Trail Endurance (TRT) Race usually has hundreds of runners participate each year, many of them international, but several local athletes have been picking up the pace and showing that Tahonians can endure with the best of them. One of these athletes is Lyndsey Bednar, of Stateline, Nev. Bednar, along with South Lake Tahoe’s Ryan Weibel, were two of the top finishers at the July 15-16 TRT Endurance Run. With a time of 27:05:18, Bednar ran her way to second place in the women’s 100 mile race and Weibel took first in the men’s 100 miler. The TRT race is divided into a 25 mile, 50 mile or 55K (34 miles) route that runners can participate in. According to Bednar, she has ran other endurance races, including placing second in a previous TRT 50 miler, but this was her first attempt at 100 miles. Bednar said she’s a competitive person when it comes to running, but she wasn’t really sure what the result would be in such a long race. Anyone who has ran a marathon, let alone a 100 mile marathon, will tell you how much of an accomplishment just finishing is. Bednar said she had some struggles during the race and even thought about forfeiting after a few dozen miles due to fatigue and a foot injury. Bednar said she doesn’t have any plans to compete in any endurance races for the rest of the year, but that her focus for next year is to run a marathon in 2 hours and 45 minutes or less.